Managing SharePoint sites can be a big job, sites can vary in size and complexity, but managing them shouldn’t be a burden on the users in control. There are all kinds of tasks that come with managing a SharePoint site, adding permissions, managing outdated content, approving content, updating pages, cleaning up the recycle bin, and the list goes on. If you own a SharePoint site this is the starter guide to making your life easier! Every site is different and can have lots of different things, so make sure you customize this to your own needs, and remember if you need help feel free to reach out! I’ve setup a simple Admin page that isn’t a customers so we can go over some of the common things we see in customers admin pages. You can use some web parts that are right there provided for you out of the box, like the Site Users web part to help you manage permissions quickly, or the Popular Items (with a fix) to help you see the most popular documents on your site. Then you can add some other web parts or add-ins to really help you get the most out of administering your site, like a promoted links list for common links you are going to, and a content search web part to find outdated documents. First let’s talk about the popular items web part and what you need to do so it doesn’t pull in Pages (if you want pages you could do a custom one that only pulls in pages, but typically people want to see what content is most used). Once you have your page built, get to insert a web part, and go to Search-Driven Content, and select Popular Items. When the web part is added, edit the properties of the web part and change the query. 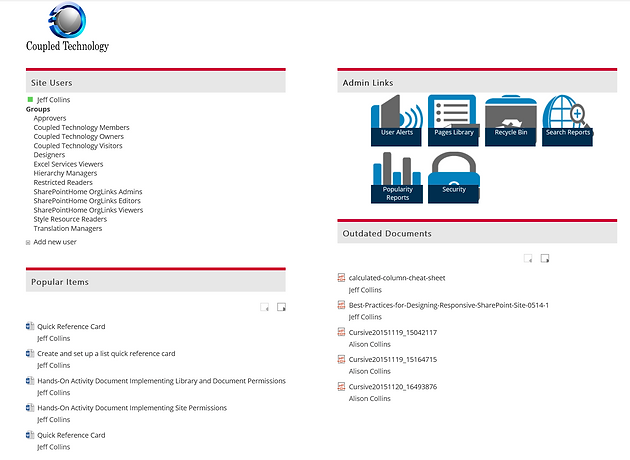 Then click on OK, now your Popular Items web part will only show documents, no more pages! The next web part we want to add is a Content Search Web Part to find outdated documents, in this case documents that haven’t been modified in 6 months. So go ahead and add the a content search web part to your page, and edit the properties and click on change the query. Once in the Build Your Query” pop up, go ahead and switch to advanced mode. Then paste the following in your Query Text” and modify the path:”https://YOUR Site HERE” to have your site’s URL. Now this will show you only documents that haven’t been modified in 6 months or greater! We also add in the pages library, because site owners are often updating pages on the site. The search reports often go overlooked, but we want to call this out as it’s a great way to see what people are searching for on your site and allow you to curate content or setup search refiners for content already there to help users find what they need. Search reports show all kinds of great features, which stay tuned for a blog post coming soon on those! As always, if you are looking for a more advanced site admin page, or help with anything SharePoint or Office 365 related, feel free to reach out! We aren’t push sales people, we just honestly want to make everyone love SharePoint as much as we do!